The flag is flown at half-staff at City College in honor of the victims of the Libyan attack on Sept 13, 2012. Photo by Evan E. Duran. 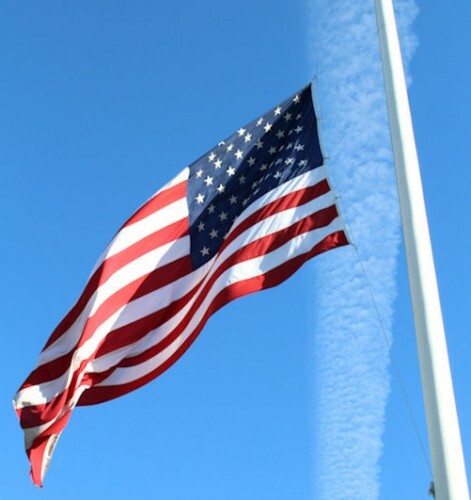 City College’s American flag is being flown at half-staff through Sept. 16 at sunset to honor those killed in the attacks on the U.S. diplomatic facility in Benghazi on Sept. 11. The attacks left four Americans dead, including the U.S. Ambassador for Libya, John Christopher Stevens, and three others in an act that U.S.officials are saying may be linked to extremists inspired by al-Qaeda, according to reports from the Washington Post. A video of President Obama’s full response to the Libya attacks is available here. This entry was posted in Briefs, News, Sac City Express (SCC) and tagged Americans, Crystal Lee, daniel wilson, Evan Duran, flag, flown, half-staff flag, honors, killed, Libya, Obama, U.S., United States. Bookmark the permalink.